This is a technique blog with contributions by artists like you! Use the email me link in the right column to send me your technique! Any and all mixed media techniques are welcome. You are welcome to use these techniques for personal use only. They may not be published anywhere else or used in any commercial way without prior express written permission from the submitting artist. Copyright is retained by the submitting artist. You are welcome to link to this blog. 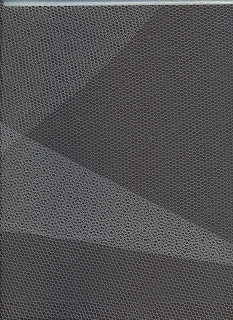 It is white netting against a piece of black card stock. Bought it on sale at Joann's. This is the roving arranged up and down and across on the bamboo mat. This is how it looks when I have the roving, netting and mat all rolled up. One side of my felt. Other side of my felt. Figured I would want both sides to look good in case I decide to do something where you see both sides and not just one. Well, I did some wet felting this afternoon instead of working on my paper. Cannot think when I am sick. My sinuses are seriously messed up. My daughter was sick last week and now it is my turn. I am sitting here with a cup of tea resting now as I type on my laptop in my comfy chair. 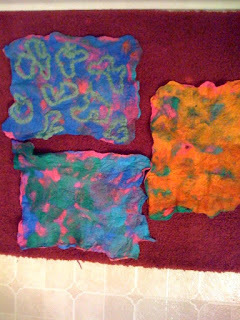 Wet felting is a lot of fun and it is REALLY easy to do. What can you do with it? 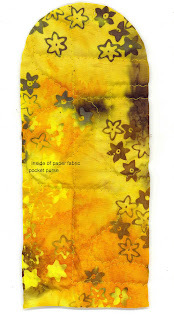 You can use it for surface design on quilts and other fabric based artwork. You can use it to make ATCs. You can use the soldering iron or heat gun and put some holes in it. I have not tried to torture this type of felt since it is still wet. I figure the thin spots will melt. If not, then I can just use my finger and poke holes in it. You can use it as texture on anything paper based. You can use it to make journal covers, purses, checkbook covers, or anything else you would use felt for. It is so much better than the felt you buy at the local craft store though. The colors are fantabulous! You can also add little felt flowers or pieces of yarn/fibers for some contrast. I also made a felt cane but not sure how that will turn out. It is still wet and it needs to be dry before I cut into it with a razor. Can't wait. Will post that pict once it is dry. *roving in various colors - can be wool, alpaca, merino, or silk. Merino roving is cheaper. A lot of people hand dye it. I have silk and merino roving. I use the merino roving. They come in long strands of thick bunches. Do not use the roving at the craft store. 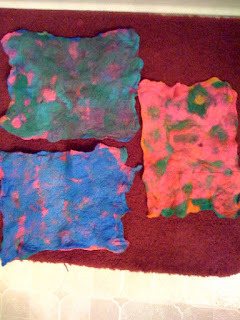 The colors are not great and they do not fluff well for wet felting. I don't like to use that for needle felting either. Yes, I am a roving snob. My little Chinese flat nose is up in the air right now. *netting - I use white netting that is sold right by the tulle. It looks like tulle but the grid is a bit larger. Will post a close-up pict of it. It is $1.29 a yard but on sale at Joann's this week. You only need enough for the size of your surface - a bit larger. Buy a bit more since the netting may tear when you separate the felt from the netting. You can substitute tulle but I have found that does not work as well. *bamboo placemat or bubble wrap - I tried it with both but prefer the bamboo placemat. I could roll the felt better with that than the bubble wrap. If you use the placemat, wash it first since it might be a tad dirty and will come off on your felt (if using light colors). I used both sides of the bubble wrap - bubbles in and bubbles out - and it did not make a difference. * Squirt bottle or container of soapy water - I used my dish soap with a cup. I did not have a clean squirt bottle. You do need to be near a hot water source or microwave though. 1. Give yourself an inch or so border on your mat. If your roving goes over the edges, then it might not get felted. Choose a color that you like. Cut or tear off a small chunk. Take that and pull it apart until it looks like fluff. It does not have to be evenly fluffed. Lay it down on the mat or bubble wrap. The fluff should be all going in one direction - up and down or across. Lay down one layer on the mat giving yourself a little border so it does not go over the edge. You do not have to do it really evenly or worry about missing some spots. The other roving will cover it. I actually like holes in my felt. 2. 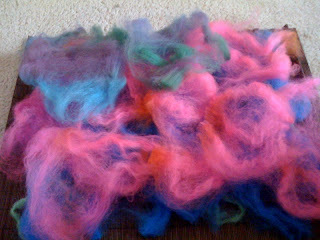 Do the same thing with different colored roving but do it in a 90 degree direction. If you did it up and down the first time, do it across now. You want a gridlike design so the roving can catch onto each other and turn itself into felt. You can do it with the same colored roving. The importance here is the direction. So, one layer would be up and down, next layer would be across, 3rd layer would be up and down, 4th layer would be across. You get the idea. 3. Repeat with different layers until you happy with it. The felt will come out thinner since it is fluffy. The minimum amount of layers is 3. The most I did was 5. I would think you could do a few more layers but would take longer to felt. Push the roving in from the edges. 4. Lay a single layer of netting on top of your roving and mat. The netting should be slightly larger than the size of your mat. 5. You can do this next step on a large pan or area where you don't care gets wet. It has to be the size of the mat or larger. I did it in the bathtub. I put the mat, roving, and netting in my bathtub. I ran the water in my bathroom sink until it was hot. I squirted a bit of dishsoap into my cup and filled with hot water. I slowly poured it over my netting and roving. I put some more hot water in and did it again. I added a bit of dish soap when my hot water in the cup was clear. It is a bit more wasteful this way but it worked. You could also use a squirt bottle with hot water and a large squirt of dishsoap. I use Ajax. You don't need to cover the entire area but most of it. I had a cup of the hot soapy water on hand in case I missed a big spot. 6. Use your hands and press down on the netting and roving. Push roving in that goes over the edges. Use your hands and gently rub the netting back and forth to agitate the roving and start the felting process. Do that for a few minutes until the roving is well wet. 7. Starting from one end of the mat, roll up the net and roving. It does not have to be really tight but it should be a firm roll. It is okay that the water comes out. Use rubber bands and tie the ends. 8. Put the roll on a paper towel. I folded mine in half. I used the bathroom counter. Some people might find it easier to do it on the floor with their knees holding down one end of the towel. Using your palms, roll the roll back and forth about a 100 times. Make sure your palms go to both the middle and ends of the roll so the felting is even. If you just roll the middle section, then your ends will not be felted well. Do not apply too much pressure or your netting will stick to your felt too much and will tear when you try to separate them. Yes, I did that once. It is not the pressure of your hands but it is the agitation caused by the rolling that does the job. You will notice your towel getting wet with soapy water. That is normal. 9. When you are doing this step, pay attention to what direction the felt was on the mat. Unroll the mat and gently separate the felt from the netting. You will notice shrinkage. No, I will not make any risque jokes here even though I may be thinking it as I am typing. Turn the felt 90 degrees so that the width side is now on the length side. You can tell because the felt will probably be longer on the width side and the length side will be shorter. Basically, you are doing a half turn so that you will be felting it in the other direction to make sure all the roving fibers get felted. 10. Put the netting back on top, roll up the mat, and put the rubber bands on. Do the rolling thing again for 100 times. 11. Take off the rubber bands and unroll. Carefully take the netting off the felt. 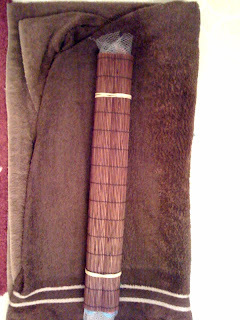 It is done if it is really flat without a lot of loose fibers or loose chunks. You should be able to crumple it up in your hands and it comes back like a piece of cloth. If it does not do that, then repeat the rolling process one or two more times in different directions until you get a nice piece of felt. 12. Rinse in hot water until the soap comes out. I wring it dry. I figure I can iron it later. You will notice that there has been noticeable shrinkage. Lay flat to dry. I hung mine up on the shower curtain rod. Kinda tired now. Will tell you how to do the felt cane later on. Come back and tell me how yours turned out. Better yet, email me a pict. I would love to see how yours turned out. Oh yeah, the blue one with green yarn squiggles. That one is sooo coool! All I did was cut out pieces of yarn and arranged them on the bamboo mat. I laid the roving on top of it. Love how that came out. Love it! This one shows how I sewed on the cloth strip and how it looks tied. Random zigzag sewing. Some of the batting is showing through the edge. How it looks after I cut out the quiltie sandwich with the template. How the inside of my pocket purse will look. Other view of how it looks after is it sewn. Love the fabric paper background! I am sure that there is another name for it. That is just what I made up. I know that I have not posted techniques for quite awhile now. I just started a new school year and have been busy with that. I start my reading cohort next week and will be busy with that for the next 3 years. It is only once a week though or I would not have considered it with my two kids. I have slowly been weaning myself from swaps. I have told myself that I cannot host or do any more swaps because of everything else in my life. I could not pass up a fabric paper swap though. 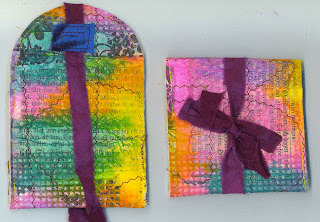 These pocket purses for for CCSwaps - part of the Next Generation Stampers Yahoo group. This is a pretty easy thing for a fabric newbie to make. If you are more experienced with sewing and quilting, then it should not take you long to do this. The fun is in how you embellish it - embroidery, flowers, stamps, whatever you want. I have chosen to leave it like it is because I like the background images. If you have not tried making fabric paper yet, then you are in for some fun. Beryl Taylor's book has the complete instructions and so does various issues of Cloth Paper Scissors magazine. You do not have to use fabric paper, you can use any type of fabric instead. I am not going to go into detail on how to make fabric paper. I have done it a few times on my other blog. sewing machine and thread - you can hand sew this as well. The pocket purse template was made with a file folder. I just measured a 4x8 rectangle and used a compass to draw an arc on one side for the purse flap. Email me if you need me to send the template to you. 1. Cut out a section of fabric paper larger than the purse template. 2. Lay the fabric paper section on top of the batting and your bottom layer of fabric. Make sure the bottom layer is facing the right way. When you cut the quiltie sandwich, but the batting and bottom layer a little larger than the fabric paper piece. Unless you are really good at pinning, the sandwich will shift a little and your batting will bunch up a bit. You don't want to have less material area than you wanted for the pocket purse. 3. Starting from the middle, randomly zigzag stitch going outwards. Don't stitch in narrow rows or your purse will be really flat with not puff at all. If that is what you want, then do that. No need to worry about the edges. You will sew the edges after you use the template. I like to use a contrasting color for the thread because I think the stitches add to the background. Alternate between zigzag and straight stitches if you want more contrast and texture. Trim loose threads. 4. Place the purse template on top of your quiltie sandwich. Cut it out according to the template. You may want to pin it if you don't want any shifting. I am not that exact, so I don't bother. 5. Sew the edge opposite your purse flap. Trim threads. 6. Fold the purse over so you get the pocket purse form. Decide how much of a flap you want. Starting at one end of the pocket, start sewing. Go over the edge where the pocket ends and the flap begins so you won't get tearing later on from opening or putting stuff inside your pocket purse. As you are sewing, you are keeping close to the edge. Just go along the border of the entire pocket purse. You are sewing in a big "u" shape. Just be sure that you don't sew across the pocket purse so you sew the opening shut. Trim loose threads. 7. Cut a piece of ribbon or strip of cloth long enough to be used to tie the pocket purse closed. My strip of fabric was a little less than 20" long. Also, cut out a small scrap of fabric in a rectangle shape slightly wider than the ribbon or cloth strip. 8. Position your ribbon/cloth strip over the top of the flap and put the scrap of cloth over it. Sew over it several times to secure the ribbon/cloth strip to the flap. 9. Embellish as desired and you are done! I don't remember if I mentioned in previous blog posts or not that the idea for them came from Jenny Crossley's article in Somerset. I just found her blog and she has some great stuff on there. I loved the deMengish type art. The super copper paint I used was Lumiere. All the background paints - silver, bronze, and super copper were Lumiere paints. I am doing some trades with people in my Mixed Media Art group. 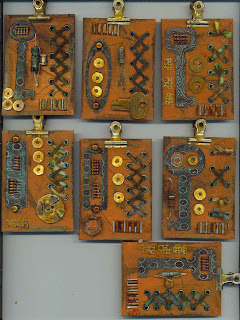 I originally got the idea for the faux metal background from the Mar/Apr issue of Somerset Studio. It is from the "Industria" article starting on page 79. I first tried it with silver Lumiere, then bronze, and now super copper. I like the silver and super copper the most. 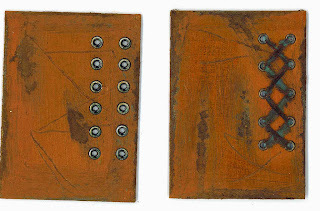 The copper look is great - like it's all rusty. 1. 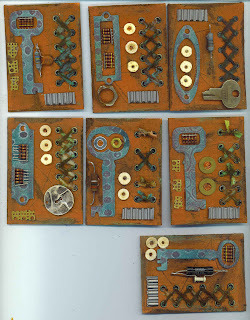 I took some chipboard ATCs and painted them with the super copper. Two coats - let dry in between coats. 2. 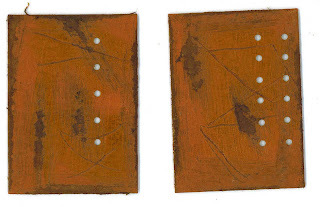 Take some coarse sand paper and sand the edges and random spots of the ATC. You should go all the way down to the chipboard. Wipe off residue. You can also take the end of a paper clip or something similar and make some deep scratches. Not too many - just a few random ones. 3. 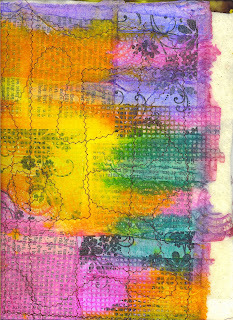 Use a Distress pad in frayed burlap and rub it all over the ATC. You can use a sponge but I just use the pad itself. I do the edges first and then rub the pad in a circular motion in the middle. Make sure you get the exposed areas that you took off with the sand paper. I also used some green and walnut stain in different areas to add to the look. I also used a dab of interference green oxide fluid acrylic in random areas. It gave that greenish verdigree look. Let dry. 4. I did the holes next. I used my crop-a-dile. Punch the inner holes first so you can line up the outer holes later on. It is easier that way. You can adjust the crop-a-dile so that the hole is punched the same length from the edge every time. Put on eyelets. I did sand the eyelets and used a little interference green oxide on them so the eyelets did not look new. 5. 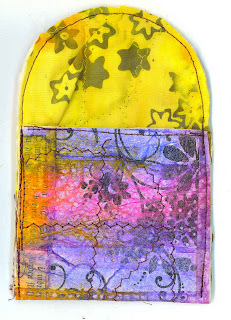 Take some narrow strips of fabric and use some Distress inks on them so they don't look so new. I used some dyed muslin. 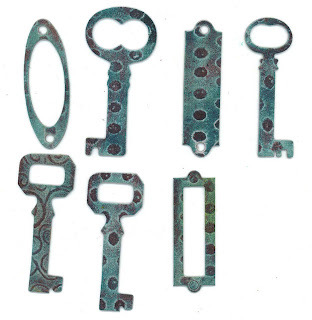 You can also just use the ink on the fabric after you have put it through the eyelets. I did both. If you want the "X' like I have, then you need to start at the top and go from the back to the front. Cross the fabric so you have your first "X". When the ends are in back again, take the ends and put it through the other end to the front. Pull tight. That is what lets you make the next set of "X"s. Cross the ends over and put through the eyelet to the back of the ATC. Once the ends are at the back again, take the ends and put them through the front of the other end. So, you are not confused. There is a left and right eyelet hole in back. Where you pulled through the right end, take that right end and pull it through to the front of the left hole that is next to the right hole. Take the left end and pull that through to the front of the right hole next to it. Pull tight. Now you can cross the ends and make your next "X". Do that until you get to the bottom. Knot in back and cut off excess. 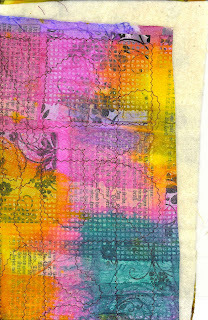 Take some Distress ink and rub it on top of the fabric until you get the look you want. I used some green, blue, brown, and red randomly. 6. Pick out pieces of grungeboard that you want to use. I got my grungeboard from Frances at heartsintouch.com and Christina at skybluepink.com. 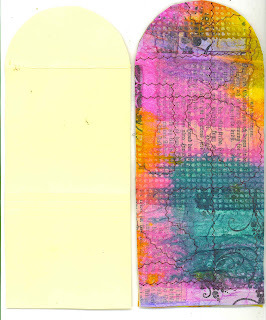 Use a Distress pad in whatever color and rub into the grungeboard. Spritz a little water on it and blend the color into the grungeboard. Dab excess moisture off with paper towel. Rub another color on top to get the top texture a different color. I used blue for the background and red for the texture. 7. Position your elements on the ATC. I was going with mostly found objects except for the grungeboard. I used a hot glue gun (my Dremel one) to adhere the elements to the ATC. I used hot glue because I think it adds to the look. The only thing severely annoying about it was the little glue strings all over. I had to use a pair of tweezers to get all of them off. 8. Use some fluid acrylics to color some of the elements so they don't look so new. 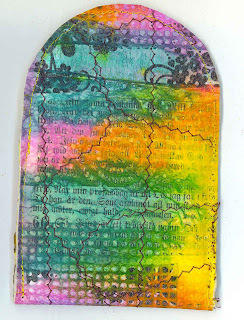 I used some transparent yellow oxide, transparent red oxide, and interference green oxide. 9. The grungeboard looked too bright. So, I used my finger and rubbed on some walnut stain (Distress Ink). I sanded the grungboard down a little to get it a little rougher looking and then rubbed some more walnut stain on. 10. I punched holes where I needed to put brads. I added a little rusty clip. Done. You can click on the picts for a larger view. Comments welcome. You can get individual domino, mah jong, and other game tiles at skybluepink.com. This is an easy method of coloring the tiles and then stamping an image with StazOn. I tried embossing but it did not work well even with an acrylic base. Must be the nonporous surface. To get the great color, you just need to sand the blank side of the game tiles a little. Wipe off dust. Put in pot with some tea bags or coffee grounds. I put in lots of coffee grounds. Put in enough water to cover the tiles and then some. Let boil and keep to low boil 45 minutes to an hour. Stir periodically. Check the color. Some will color better than others. Rinse, let cool, and dry them off with a towel. Stamp on them with permanent ink. I have also tried it with herbal tea and have gotten the greatest burgundy/plum colors. You want the water concentrated with tea or coffee so the game tiles will stain. This is the on page 79 called Industria by Jenny Crossley. It is the Mar/April issue of Somerset. 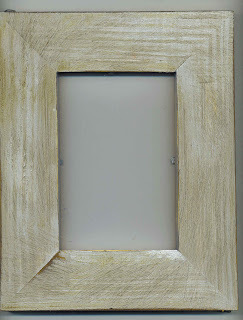 I have done a similiar technique with sandpaper and paint but never lumiere. Complete step-by-step instructions are in the magazine. 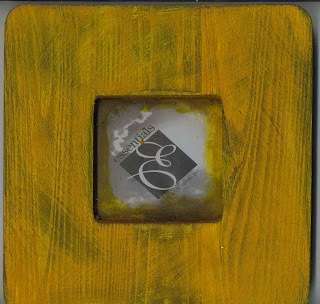 It also works with other colors of lumiere and acrylic paints. I also used the Distress inks in walnut ink and the green one. I really liked the ATC. I did not take off as much paint as they did in the magazine. I will try to take off more the next one I do. I use color wash. I did some techniques in the beginning of this blog with Adirondack color wash. Here is the link so you can see what the colors are. There are a lot of scrapbook/stamp stores that carry it. If you don't find it, there are a lot of online vendors for it. I buy mine from heartsintouch.com or franticstamper.com. Adirondack color wash is great for dyeing fabric, dyeing paper towels, and coloring paper. I do an emboss resist with Color Wash.
Last night (well, yesterday but I watched it last night) on Simply Quilts (which just came back on here) they were dyeing silk. The guy wet it with white vinegar before he poured the dye on it, then stuck it in the microwave at half power for 5 minutes (in a microwave saft dish of course....lol) . Then he rinsed it and let it dry. He did not lose much color when it rinsed it in cold water. I decided to try the same thing tonight. I used a piece of white tone on tone that has little music notes on it. I laid the fabric in the dish, poured some vinegar on it to wet it and squeezed out the excess, then sprayed a few colors on. I spread the fabric square out in the dish and put it in the microwave on 5 for about 2.5 min since I had a small piece of fabric. I kept checking it until it was dry. When I rinsed it out you could barely see the water change color. The color is really set! If you don't want to invest in a lot of dye and chemicals, it is a quick easy way to color a little fabric at a time. You just might need to create that perfect color for a project! Reading Interventionist by day and mom 24 hours a day. When I am not teaching, being mom, or being a wife, I am creating art. 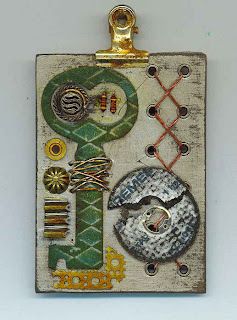 I am mainly a fabric, collage, metal, art jewelry, and Dremel Artist. I am addicted to my sewing and felting machines. I love to teach, to blog, and to share my art techniques.You will find me mainly on Facebook.